Eight parts in grey coloured resin; four pieces of fine metal wire; colour instructions on folded A3 sheet and one A4 sheet with six suggested colour schemes. 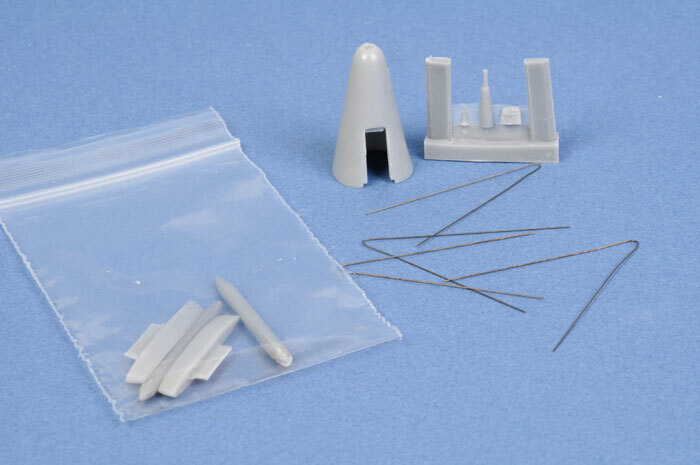 Red Roo Models has released a 1/72 scale resin conversion for a Meteor U Mk.16/ U Mk.21 drone. 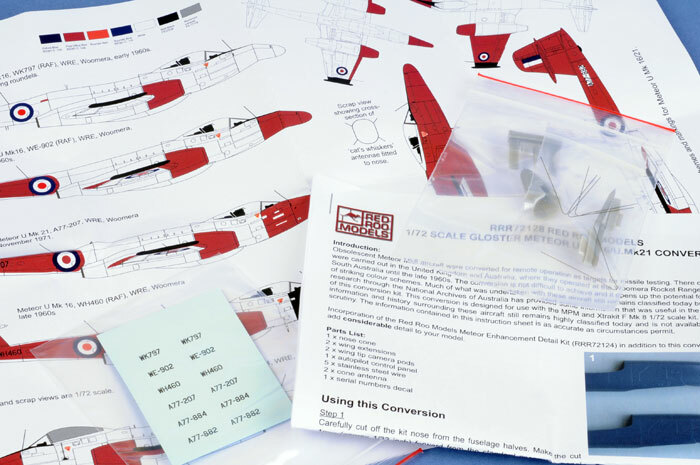 This conversion is designed to fit the Xtrakit / MPM / Airfix family of Meteor Mk.8 or PR Mk.9 kits. These unique drones were operated by the RAF and the RAAF in the 1960s and early 1970s during the British atomic tests at Woomera in South Australia. Even today, much of the information surrounding the operations of these aircraft remains classified, but this has not prevented Red Roo from offering a fascinating selection of Meteor drones for the modeller. The conversion comprises a bag of six resin parts for the distinctive pointy nose cone plus new cylindrical pods and wing tips. The nose is hollow, and all parts in my sample were cast flawlessly. There is only minimal cleanup required before use for any of the resin parts, but there is a little bit of work required on the kit fuselage and wings. The kit nose and wing tips must be cut off. The excellent instructions provide diagrams and colour photos to supplement the detailed text, so there is not much chance of misunderstanding. Also helpful is the illustration pointing out drilling positions for the swag of aerials and sensors that are fitted to these aircraft. Red Roo Models includes fine metal wire for these aerials and sensors. The instructions include full colour profiles of six suggested subjects. All of them wear variations of the high visibility red and white (and a little black) markings on these remote controlled atomic guinea pigs. If you are a modeller who does not enjoy building cockpits, one of the aircraft even has its canopy painted over with alumimium lacquer! Decals are supplied for all the serial numbers of the subjects depicted in the instructions. National markings are not supplied but presumably the donor kit will include these. Although the box top mentions that the parts are designed for the MPM/Xtrakit Meteor, please note that the newly released Airfix kit is, in fact, the same model and will also be suitable for Red Roo's drone conversion. The squared-off wingtips fitted with the narrow pods combined with the new pointy nose give the Meteor a unique new profile. Add the brilliant Post Office Red and White paint to the mix and you have a truly striking subject. 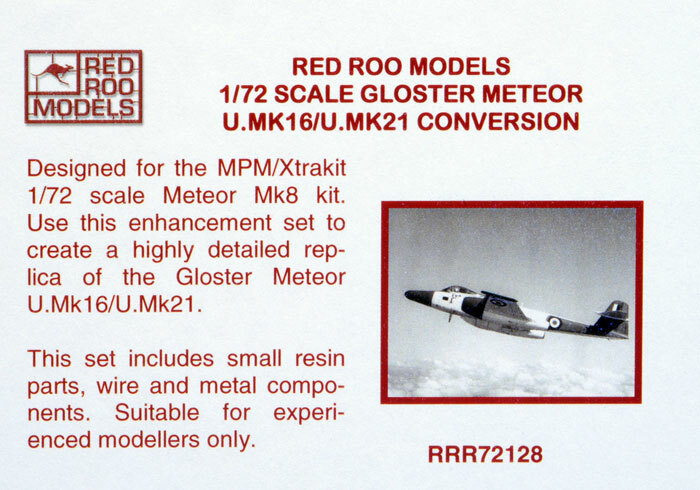 Red Roo's 1/72 scale Meteor U Mk.16/U Mk.21 will be a fairly straightforward conversion that will result in a very interesting Meteor.